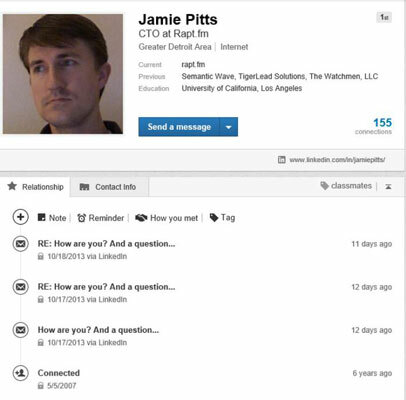 From the LinkedIn Contacts screen, click the wheel icon on the top right of your screen. You are taken to the Contacts Settings page. Click Sync next to the name of your e-mail system and/or address book to sync your e-mail messages with the LinkedIn Contacts system. If you’ve got Gmail, Yahoo! Mail, or Outlook, click the appropriate blue Sync button to start the sync process. Follow the prompts to sync your other accounts. 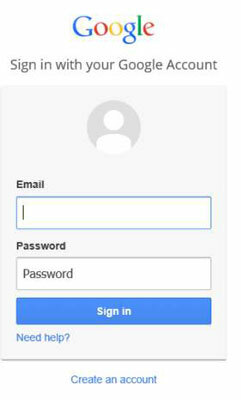 You will be prompted to log into your other account, for example, a Google account. You will get a Permissions screen. Click the blue Allow Access button to give LinkedIn the ability to sync with your Google account. Repeat Steps 2 and 3 for any other accounts you wish to sync with LinkedIn Contacts. 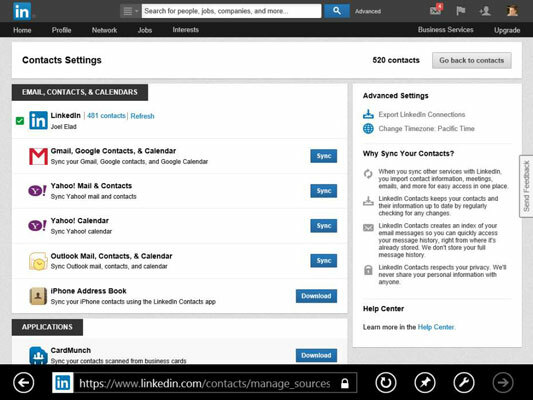 After each sync, you are returned to the LinkedIn Contacts Settings page, where you can pick another e-mail, contacts, calendar, or application provider. In addition, you can import your Outlook, Yahoo! Mail, or Mac Address Book contacts by importing a .CSV (comma-separated values) file created by those applications. 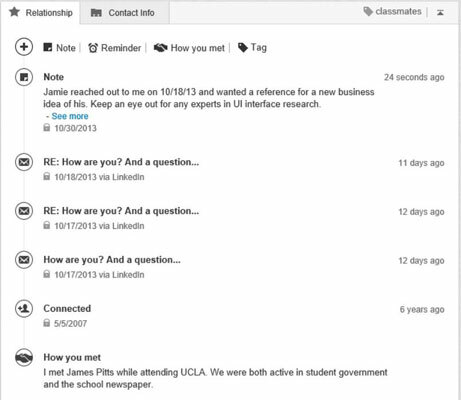 LinkedIn Contacts stores more information than just your first-degree connections. You can also add someone who’s not yet a LinkedIn member. From the Contacts Settings page, click the gray Go Back to Contacts button and pick an individual contact by clicking her name from the Contacts screen. To use the Contacts functions for any particular first-degree connection, you need to pull up the person’s profile information by clicking his name on the Contacts screen. When you reach a contact’s profile page, you should see a box with the Relationship and Contact Info tabs. 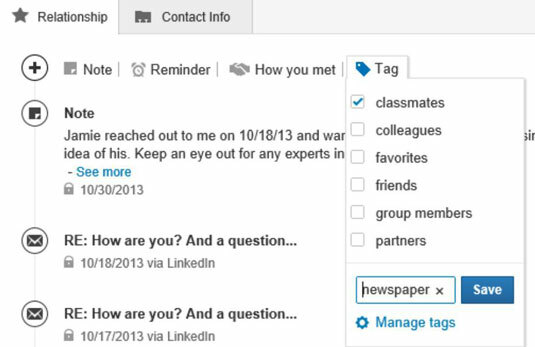 LinkedIn has already populated this box with any LinkedIn messages you’ve sent to each other. Click the Note link to add a note to yourself pertaining to this contact. Think of the Note function as a way for you to record any thoughts about this contact, remind yourself of information that was mentioned in past conversations, or jot down any questions you need to ask this person. When you click the Note link, a text box opens where you can type the note. When you're done, click the blue Save button and the note is added to the log of communications for that contact. You will be able to see this note at any point as part of your communications with that contact. Click the Reminder link to set up a reminder message from LinkedIn pertaining to this contact. When you click the Reminder link, a text box opens where you can type the subject of the reminder message that LinkedIn will send you. Using the radio buttons below that text box, decide when you want the reminder message sent to you. Click the blue Save button, and in the designated time frame, LinkedIn sends you a reminder message with the subject line you just entered. Click the How You Met link to record how you met this contact. Clicking the How You Met link opens a text box where you can record the details of how you met this contact. When you click the blue Save button, LinkedIn creates an entry entitled How you met and puts it at the bottom of the Relationship box. This way, this information is always available to you. The information you add with these functions is visible only to you and nobody else, so you can type these notes without the other person (or anybody else) seeing this information. Click the Tag link to identify this contact with your own category name. Let’s say that you want to tag your LinkedIn connections with whom you shared a certain group in college, in case you want to send messages to only this group regarding a reunion or something similar. Click the Tag link to generate a drop-down list of tags to choose from. You can select the check box next to a pre-determined tag, like colleague or classmate, or click the Add a Tag link to generate a text box to write your own tag. You can assign multiple tags to the same person — if the same person is involved in more than one category in your life, for example. Repeat Steps 6 to 9 for any contacts where you want to record any of this information. You can add this information whenever you want, it doesn’t have to be done all at once. As you use LinkedIn, be aware that these options exist, especially when you’re looking at someone’s profile page. Make notes while they’re still fresh in your mind, or after receiving an e-mail or notification from someone.